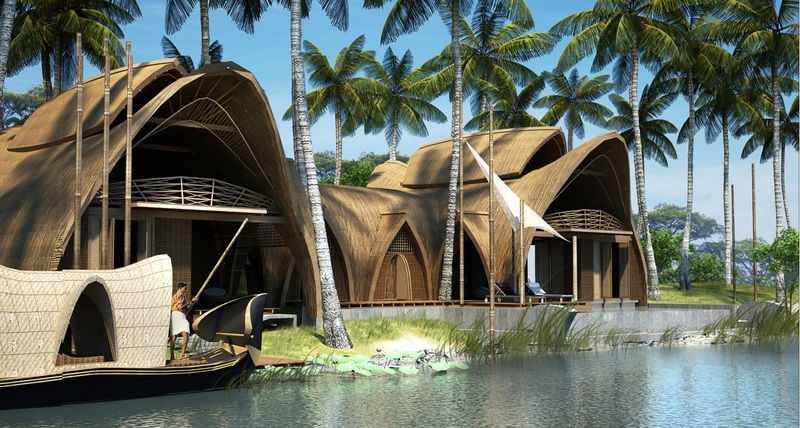 Kumarakom Resort, Kerala - Morphogenesis Architects - ArchitectureLive! Client: Shanti Hospitality Pvt. Ltd. 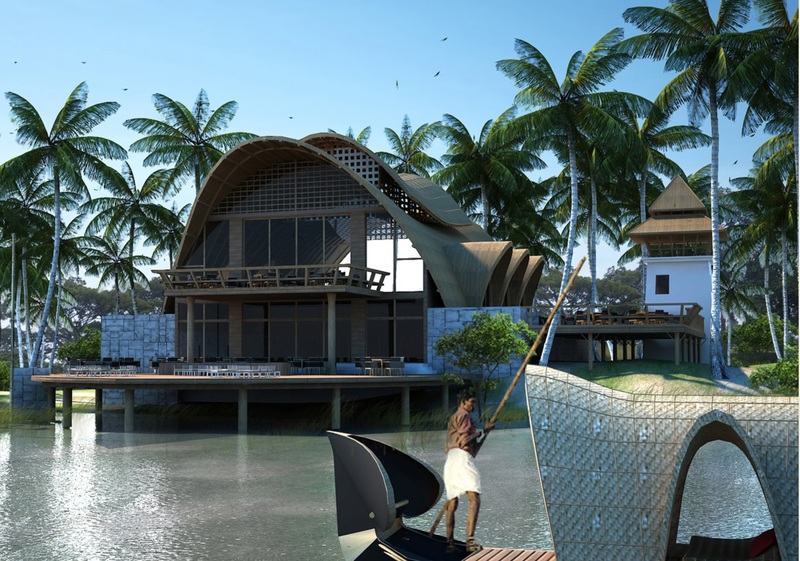 The design brief called for a luxury eco-resort in Kumarakom, Kerala. As a boutique project, in close proximity to the Arabian Sea, the objective was to offer an indulgent retreat experience, of life amidst the backwaters. Physical and Visual Engagement with the natural setting laid the foundation for the development of the globally unique design set amidst a serene landscape. 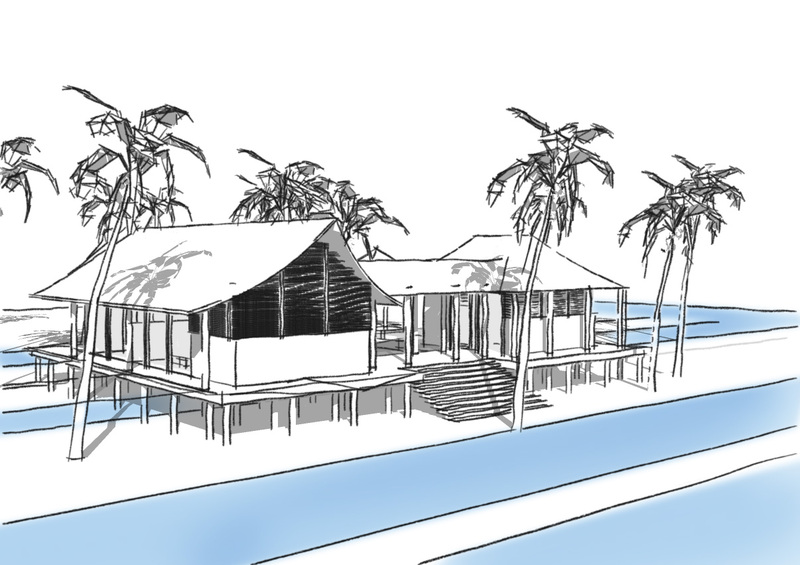 The 40-acre site on the man-made Puthenkayal island lies facing the Vembanad lake backwaters (approx. 270m of frontage). 4.2m wide water channels run through the site with alternate strips of land and water. High flood levels within the site, to touch the earth lightly and the intent to retain the unique character of the striated water and land channels, helped to determine the stilted nature of the built up structures and connecting pathways, in order to provide safety from the uncertain high flood level of the site. In order to craft a built volume within the natural site scape, this natural landscape is retained and exploited for primary movement, as the site is predominantly flooded for most part of the year. Along with this, the condition of no vehicle movement inside the site and a clear distinction within the location of facilities and villas helped to construct the master plan. A script was developed with the given conditions and to maintain a sense of peace and individual habitation, rules were set out to determine the location of the villas. (Such as placement of node points, vehicle routes connecting the node points, pedestrian movement connecting all the nodes by the shortest route, placement of facilities etc.) The Location of the villas is over-layered with the water channel running through. 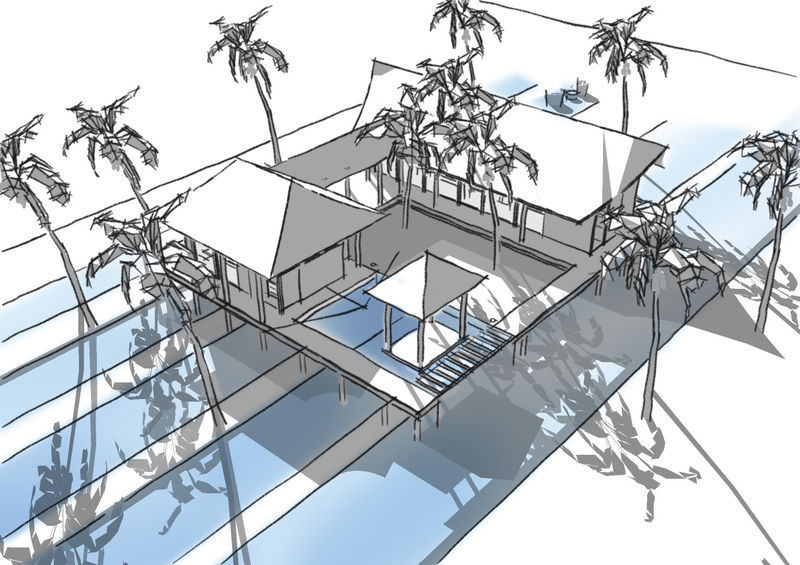 The result was a master plan with Interlocking movement systems of road and pathways periodically hyphenated with nodes connecting to a tertiary movement system linking villas. 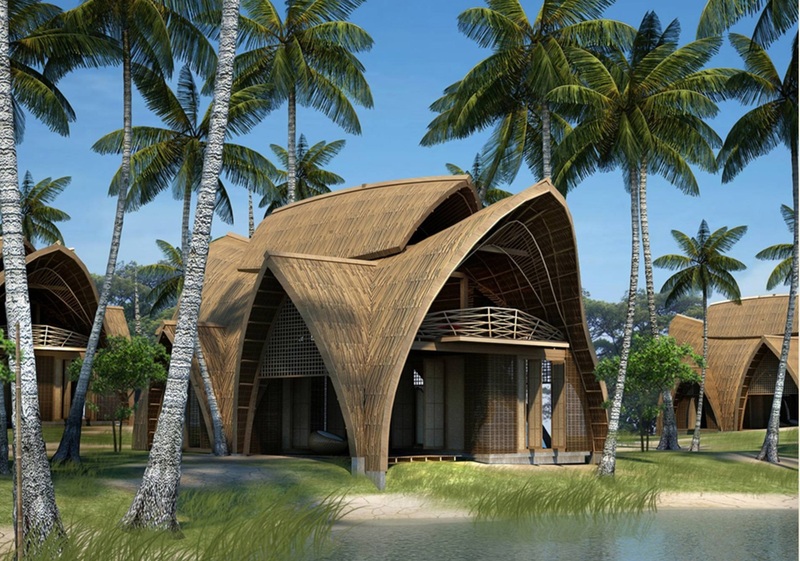 Environmental concerns dictated the form development and help to regulate the microclimate within the resort. 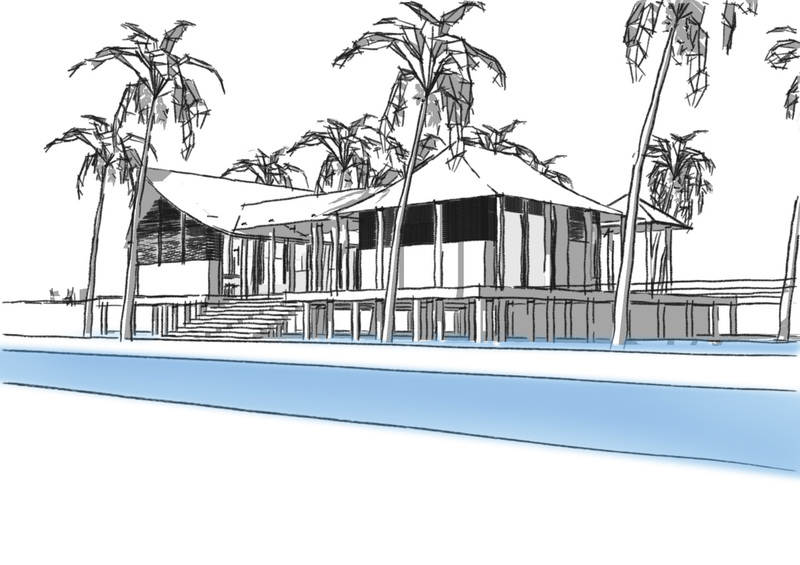 Location and orientation of the villas, is optimized to achieve maximum porosity to westerly winds, leading to wind movement acceleration throughout the site. The roof form has been derived from a tree, where the foliage spread is used to provide shade, whilst simultaneously creating a wind tunnel effect to regulate the temperature. This aerodynamic, retractable roof form with large perforated cantilevers traps the wind and filters the sun, thus increasing the thermal circulation of the space, yet maintaining light quality in the internal spaces, and further emphasizing on the views. During the day, when the winds are strong, the roof of the inner volume can be retracted, to allow the thermal regulation of the interior space. At night, when the winds are less prevalent, the roof can be retracted to divide the whole volume into two individual spaces, thereby providing the option to control the interior environment mechanically/manually. High humidity levels are countered by air-conditioning the internal environment. Rain Protection is provided with the help of covered walkways throughout the site.